Extensive preconstruction efforts, increased collaboration and a constant focus on the children who would be using these facilities ensured the Hospital explored numerous options to achieve the most value for their budget, the highest quality and a successful end result. Gilbane provided construction management services for a major project at the NewYork-Presbyterian Morgan Stanley Children’s Hospital. The multi-phased project spanned four years across various floors and departments. All construction activities were planned and coordinated within the fully occupied children’s hospital, which at times included working adjacent to patients in ICU beds. The project components included a Pediatric MRI, exam suites, Antepartum Maternity Unit, Digestive Health, Pediatric Intensive Care Unit (PICU) and a Cardiac Neonatal Intensive Care unit (NICU). Multi-phased upgrades first took place to the existing MEP infrastructure of the Hospital’s north and central buildings to meet the service capacities necessary for the additional upgrades. This included the removal and replacement of equipment and associated distribution systems, such as chillers, air handling units, steam generators, expansion tanks, hydronic pumps, control panels, exhaust fans, pneumatic air stations and dry-coolers, as well as new medical-gas risers with future valves on each floor. The majority of the scope took place in the Hospital’s penthouse MER and adjacent roofs, requiring new steel dunnage and extensive coordination for equipment rigs and routing of distribution systems. The team refurbished 10,500 square feet for the PICU which included 14 private rooms, each equipped with pre-fabricated headwall units, custom footwalls and dedicated family areas with sleeper-sofas, wardrobes and televisions, as well as new spaces for support services, waiting and consultation areas. 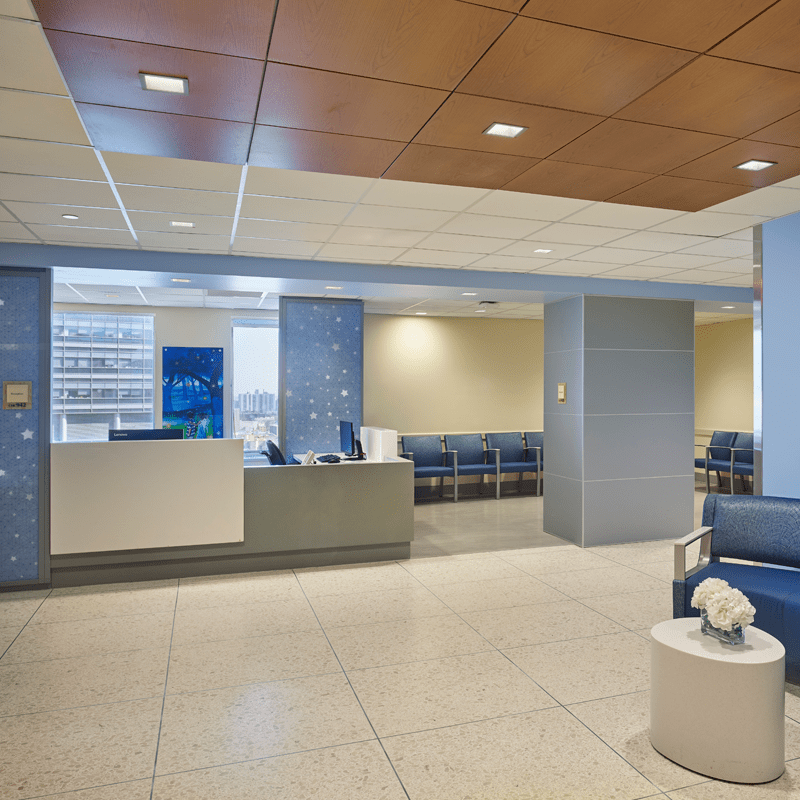 A full gut renovation of 12,000 square feet then created space for the new antepartum department. 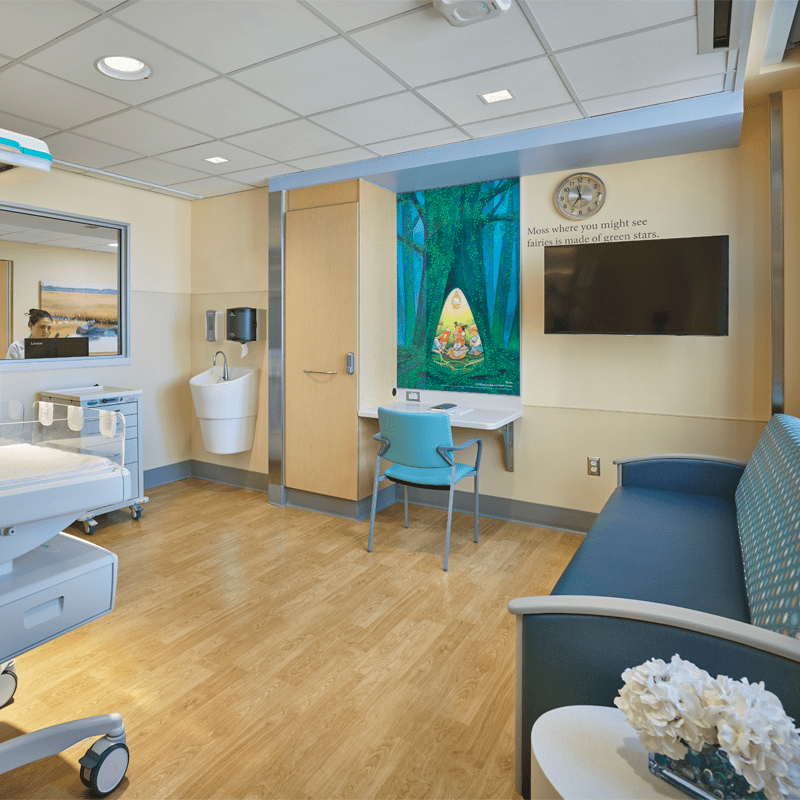 The previous PICU space was converted into the NICU, which now features private and semi-private patient rooms, as well as airborne infectious isolation rooms. This unit was created to support the Hospital’s cardiac surgery program. The patient rooms are equipped with modular-built headwall systems, including medical gases, critical and normal power and dialysis boxes. The infrastructure work was phased throughout the duration of the project to ensure each phase would be ready in time to support the new spaces as they were completed. A major challenge in an existing hospital with buildings close to one hundred years old, is to understand and remediate the existing conditions uncovered during the renovation project. 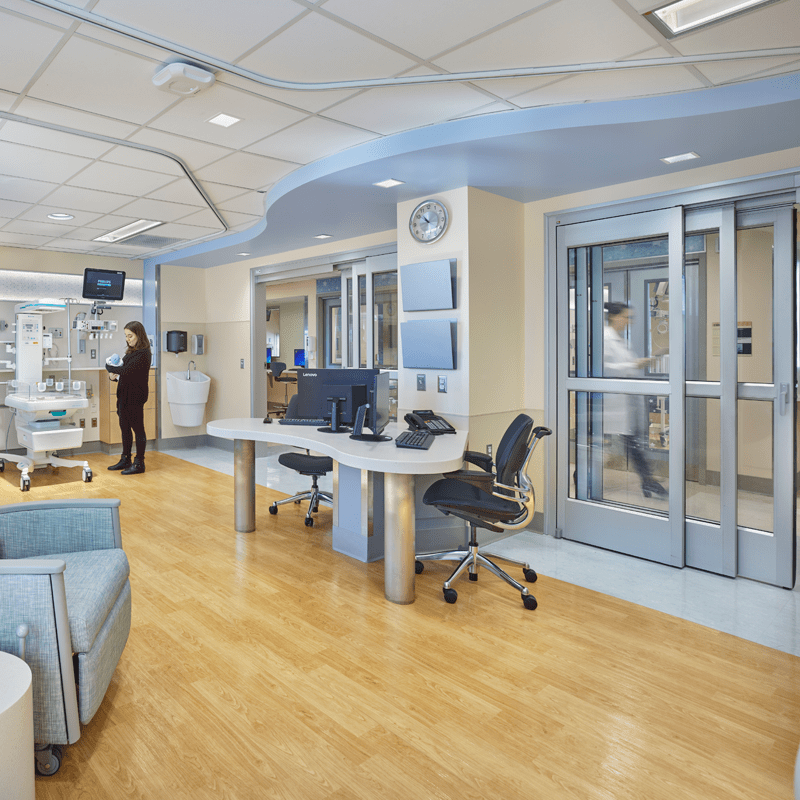 In an effort to streamline existing condition documentation and remediation efforts, Gilbane utilized our 3D scanning services to tackle two jobs at once on the 9N NICU project. With limited deck-to-slab heights, critical MEP services and unforgiving existing conditions, the scanning provided Gilbane with an all-encompassing 3D model. This technology allowed Gilbane to finish MEP coordination faster than scheduled and with greater accuracy, directly resulting in cost and scheduling benefits. In addition, the integration of BIM 360 allowed Gilbane to proactively log and track the progress of remediation efforts, rolling completion lists and punchlists, with customizable reports for the client and trade contractors. Putting quality at the forefront, this software allowed the Gilbane team to setup automated weekly reports with the trade contractors to document benchmark quality inspections, upcoming tasks and architect/engineer punchlist items. With construction occurring in an operational hospital, the main challenge was to minimize disruption to patients and staff during the multi-phased renovations. Before the start of each phase, Gilbane invested significant time collaborating to present detailed phasing plans to the Hospital, which were tailored to maximizing patient safety and limiting impacts to the surrounding units. As part of the project, the Gilbane team needed to offset approximately 10 pairs of domestic water risers on the floor below the new 10C Maternity Unit, which was home to the current 9C Pediatric Intensive Care Unit. In addition to the work required in the active PICU, the team was tasked with coordinating the removal of the existing structural concrete slab above in eighteen locations, mostly above patient rooms, to create private bathrooms for the new unit. Putting patient safety first, Gilbane understood this monumental task would only be completed successfully through strategic phasing plans tailored to the needs of staff and patients, as well as considering the facilities support to shutdown critical risers supplying water to five floors below. Through interactive planning sessions with the unit’s directors and staff, Gilbane’s final plan become the foundation for a successful 2.5 month, six-phased plan, allowing the unit to operate at 75% capacity throughout the project duration. The Gilbane team successfully limited noise, vibration and overall disruption. The construction team recognized that continuity of care was the most important client requirement, and worked collaboratively with all project stakeholders to maintain this for the Hospital and its patients.